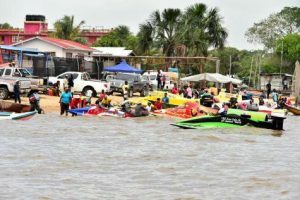 Concerns were Saturday being raised about the transparency of the Bartica Regatta slated for Sunday because two of the key persons are also from a participating team, but a top organiser insisted that the annual event would be held. Stephen Belle said 10 boats, including his and those from Pomeroon, would boycott the event if Starter, Keith Woolford and Clerk of Course, Dave Scott were not replaced overnight because of conflict of interest. “You can’t be the umpire and the batsman at the same time. They won’t have a regatta until they meet with us and we can iron this out by tomorrow (Sunday) morning before the President comes,” Belle told Demerara Waves Online News. Belle said his boaters and those from the Pomeroon were not opposing Woolford and Scott be assigned other duties, but not Clerk of Course and Starter. “They won’t have have any regatta without us an the Pomeroon people”. Further quizzed on why the Clerk of Courts and Starter should also be participants, Boodhoo declined to comment further: “Sorry, Sir, I can’t continue this conversation because I am busy here at the beach”.